In the 1950s, people were paranoid about the Commies, the bomb, their neighbors, whatever. In the 1970s, they were just paranoid. After Watergate essentially destroyed any chance that a whole generation of Americans would ever trust their government, the decade witnessed a cycle of movies whose entire theme consisted mostly of "they're trying to get you. Who? Doesn't matter." At the same time, the American cinema witnessed an explosion of remake fever: not so dire as our current decade, perhaps, but it's still pretty shocking to witness the A-list classics that got do-overs around the turn of the '80s. So it was really a perfect time to remake Invasion of the Body Snatchers. And under the hand of up-and-coming director Philip Kaufman, it turned out to be, if not quite as great as its predecessor, still a pretty damn fine genre picture for its day. First things first: it's not steeped in politics, and whether that is a good thing or not, I will leave to the conscience of the individual. It is, however, unmistakably and utterly a '70s film: from the casting of Donald Sutherland in brown suits as the hero, to the fixation on self-help gurus, no-one could ever mistake this as being a product of any other time. Perhaps the chief distinction between the two films - and one that certainly reflects their different eras - is that the 1978 Invasion is no longer set in a quiet community on the edge of nowhere. The original small-town "everybody knows your name" mentality was very much a part of the pre-Vietnam American mindset, and by the end of the Me Decade, it would have come across as hopelessly quaint. Instead, the 1978 film takes place in the bustling city of San Francisco. It's hard to over-emphasise how important this shift is to the relative differences between the two films. The 1956 film drew most if not all of its horror from the suggestion that the people we've known and trusted our entire lives can turn on us just like that, and the comforting places that we've always loved do not offer us even a hint of protection when we're up against the wall. 22 years later, the remake takes a look at the new cosmopolitan world that so many either lived in or aspired to, with its concomitant loss of neighborly affection, and proposes that this urban isolation leaves us abandoned in times of need. Given that seismic shift, the plot actually follows the original fairly closely: Bennell, now given the first name Matthew (Sutherland) is a public health inspector now, but he still spends the first portion of the movie slowly noticing that a lot of the people around him are convinced that their nearest and dearest are different, so different as to hardly count as the same person. He still poohs this idea until he witnesses a half-formed clone with his own eyes, and by that point, half the people he would ordinarily turn to for help have already been snatched. All that's left is to gather the few people he can trust and get as far from the city as possible - a distant cry from the original, where "the city" was looked to as the only hope for salvation. Your twist can only be so shocking when you've titled a film Invasion of the Body Snatchers, but the 1956 film gamely attempted to make us wonder what the hell was going on right up until Bennell saw a half-formed "corpse" lying on his friends' pool table. In the 1978 version, Kaufman and screenwriter W.D. Richter do something that is really quite elemental, and yet hardly ever happens in any remake I can name offhand: they assume that we've seen the original, and that we therefore know what's going on. It's so extraordinarily simple and idea, and yet such a useful one, that you have to wonder why more filmmakers haven't tried it. Thus it takes literally seconds until the new film confesses that it's a film about aliens: the opening credits take place over a montage of gelatinous bubbles floating through space and landing on earth plants, where they bloom into two-inch long pods with pink flowers. This sequence isn't "scary" in even the slightest degree, but the mere fact that we're aware of what these bubbles portend gives it a tension that rivals anything in the first film. It's no insult to say that Kaufman's directorial style is meditative, by which I mean, he allows moments to linger on without anything much happening. 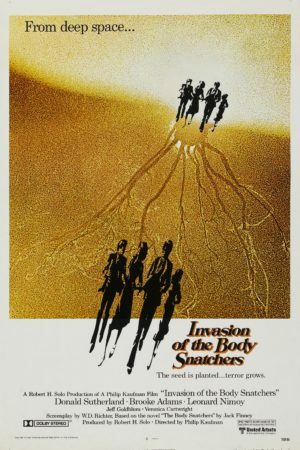 He does a lot of that in Invasion, starting right here at the credits sequence, and the effect is typically unnerving: while Siegel made his film terrifying by never letting up, Kaufman makes his terrifying by filling it full of "breathing room," moments that allow the audience and the characters to stop and think about what's going on. If it's not as viscerally frightening as the original, it's more existential, and this is a good thing: if it worked exactly the same way that the first movie did, there would be no reason for it to exist. By changing the "mode" of the horror, Kaufman justifies his film's existence far more than most remakes ever do. In a way, the 1978 Invasion is more effective than the original, for the simple reason that our contemporary world is are generally more like the late-70s than the mid-'50s. Therefore, the concerns expressed in the movie are closer to our own concerns: both films have a scene in which one of the pod people tries to convince the hero to stop resisting, using a twisted kind of logic and appeal to the fears of the Zeitgeist: in the first, that appeal is couched in terms of "be with us again, be a part of your community like you know is right," while in the second, it's much more like, "you don't need to be alone any more. We will all be together, in a way that you've always hoped for." The remake is concerned with the way that society does not always allow for the communal wholeness that the small town in the original took for granted. The ending, too, is perhaps a bit more modern; the '70s, we could argue, were the most nihilistic decade for cinema in American history, and that is a major part of the film's conclusion. In the 1956 film, a frame narrative instituted at the studio's demand takes away the bitterest part of the ending, but still provides no real hope; the end of the film turns out to be the end of the first act of our fight against the seemingly unstoppable alien force. There's a sense of, "now it's time to fight," and while the film offers no hint at all that we'll be successful or not, the feeling all humanity being in it together speaks of the can-do '50s in a way that we're no longer completely familiar with. In contrast, the remake ends with a strong implication that the war ended before it really began: the last moment of the film is a completely unexpected and completely devastating twist. The last line of the original is "It's an emergency! "; the last line of the remake is a scream of terror. This difference tells us everything we need to know.